Quake developers id Software are very fond of Apple's iPhone as a gaming platform. The first-person shooter focused id has already released Wolfenstein 3D Classic and is planning double the Doom, including a scaled down semi-remake of Doom III. 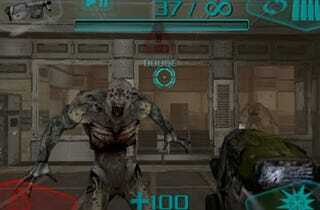 Next week, id Software will release Doom Resurrection, a new iPhone and iPod Touch game profiled by Venture Beat. According to details on the first-person shooter, expect a "next-generation" level of 3D graphics from previous iPhone games. id's John Carmack calls Apple's phone platform a "real game platform" and has his own Doom, dubbed Doom Classic, in the works. Doom Resurrection development was handled by Escalation Studios, which, with Carmack's help, got the game up and running at 30 frames-per-second in six months. Look for it to hit next week, with a Kotaku review to hit soon after.